Katie and Jonathan are newlyweds. They tied the knot in July and are now living life as Mr. & Mrs. Carter. I met them back in August when I shot Katie’s brothers wedding. Mason & Hilary. They seemed like a fun couple. Fast-forward a couple of months and I was doing a giveaway for our re-launch. We had recently re-branded and to celebrate I wanted to give away a couples session. Well guess who won??? Katie & Jonathan! I was excited, because I really enjoyed this family and I was looking forward to getting to know them more! 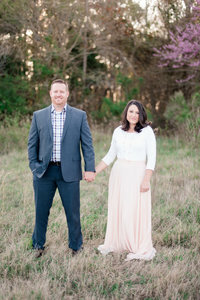 Last weekend I met up with them at Newport News Park for a Couples Session. I LOVE that Katie had a plan! She set-up a cute little picnic with wine, cheese, and grapes. She incorporated many of her wedding gifts to show their appreciation. Jonathan is not a fan of getting pictures done…which I can understand. However, he loves his wife and he went with it! I really had a lot of fun with this couple. They are down to earth and they made me laugh! The trees were at their peak at the pretty Newport News Park and the whole setting was really pretty and relaxed.